Welcome back to my blog. Hope you are having a great week! Today is day #2 of Taylored Expressions April release sneak peek. Here is my day #1 sneak peek post from yesterday. Today I am showcasing two projects using two new products from the release. The first one is a cutting plate called Rosette cutting plate. This is a beautiful floral cutting plate which can be used both in portrait and landscape orientation. 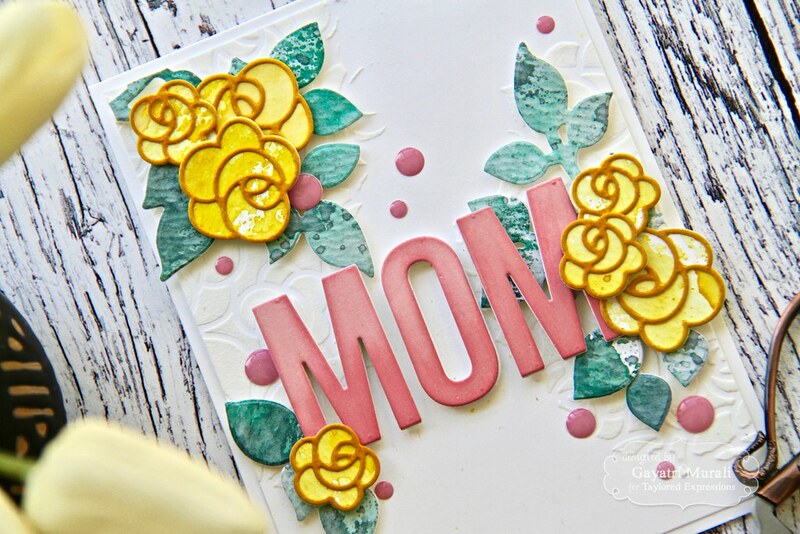 I have used in landscape orientation here combining with the new Majestic stencil, Cutting Edge Flowers stamp set and Caps Lock Mom die. 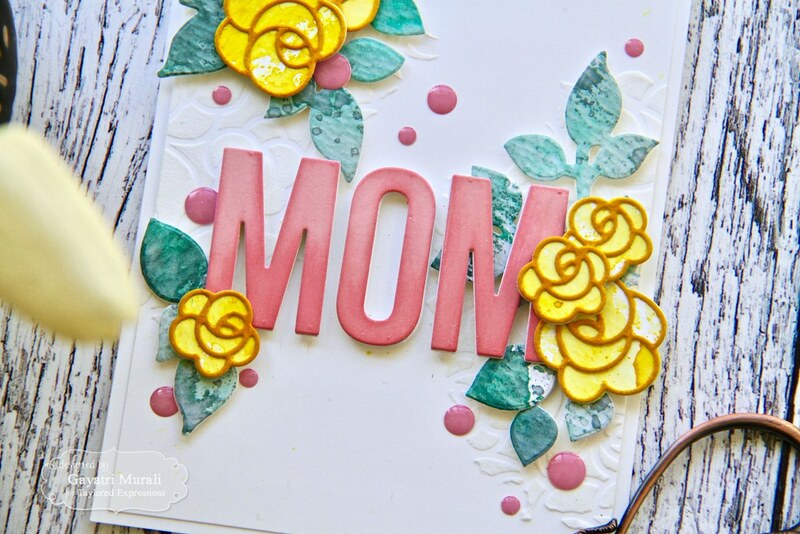 The card base is the new Guava cardstock. I love this new coral colour. 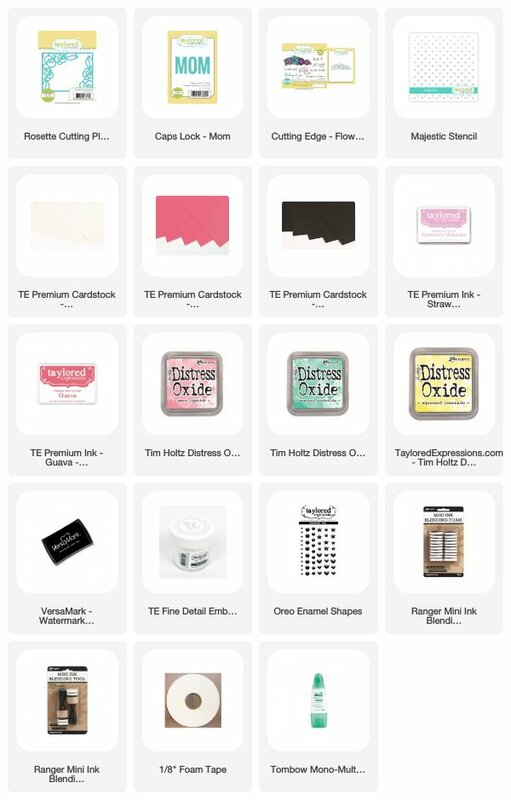 TE has both the cardstock as well as dye ink release this Thursday. For the background, I sponged Worn Liptstick, Cracked Pistachio and Squeezed Lemonade distress oxide inks diagonally. Then I laid the new Majestic stencil on the panel and sponged the same colours over the stencil but with a bit more ink and pressure. There is a tone on tone effect with the stencil. Love it. 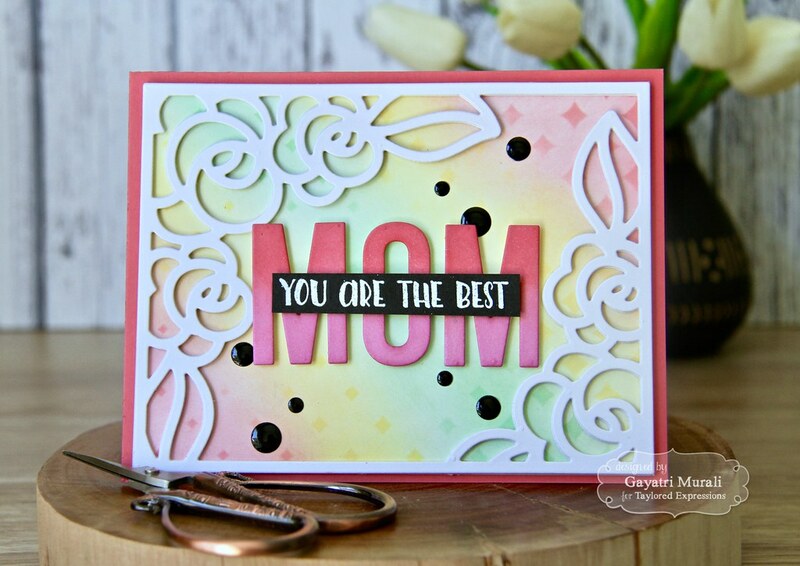 Then I die cut three of the Rosette cutting plate die using Sugar Cube cardstock panels. Then stacked and glued them to get some dimension. I adhered this on the background panel. This entire panel is adhered on the Guava card base. For the sentiment I die cut Caps Lock Mom die using Sugar Cube cardstock and sponged Guava and Strawberry Milkshake TE dye ink. Love the coral to pink ombre on the die cuts. I adhered this to the centre of the card front using foam adhesives. 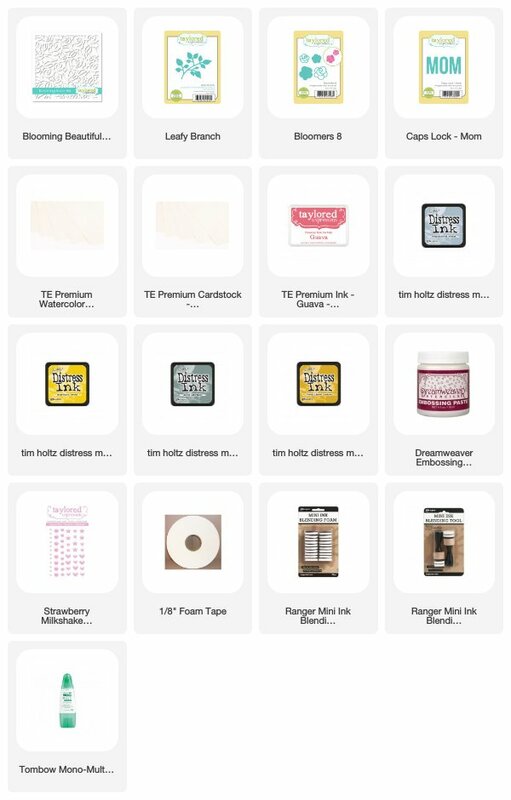 The secondary sentiment is from Cutting Edge Flowers stamp set which I white heat embossed suing the new detailed white embossing powder from TE on a strip of Oreo cardstock. 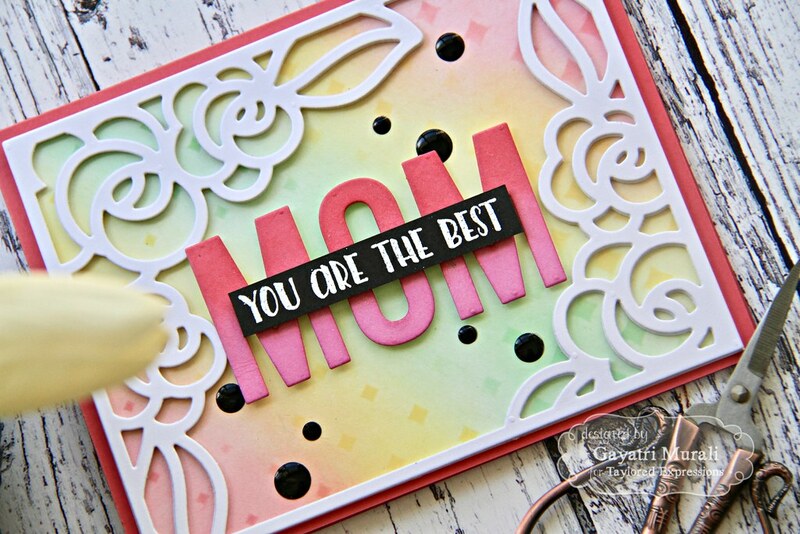 I adhered this strip on the MOM die cut sentiment. Finally to tie in the black strip, I added some Oreo enamel shapes. Here are the closeups of the card. 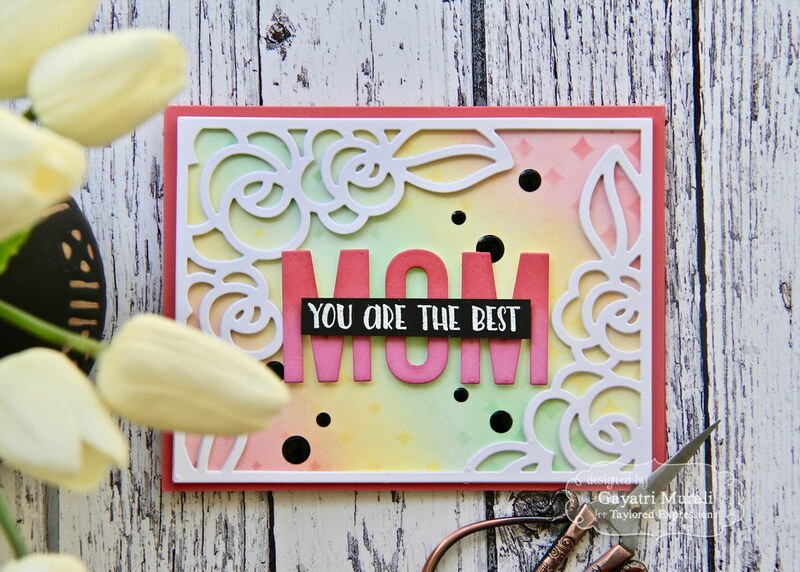 The second card showcase the new Beautiful Bloom stencil along with the new Bloomer 8 die. 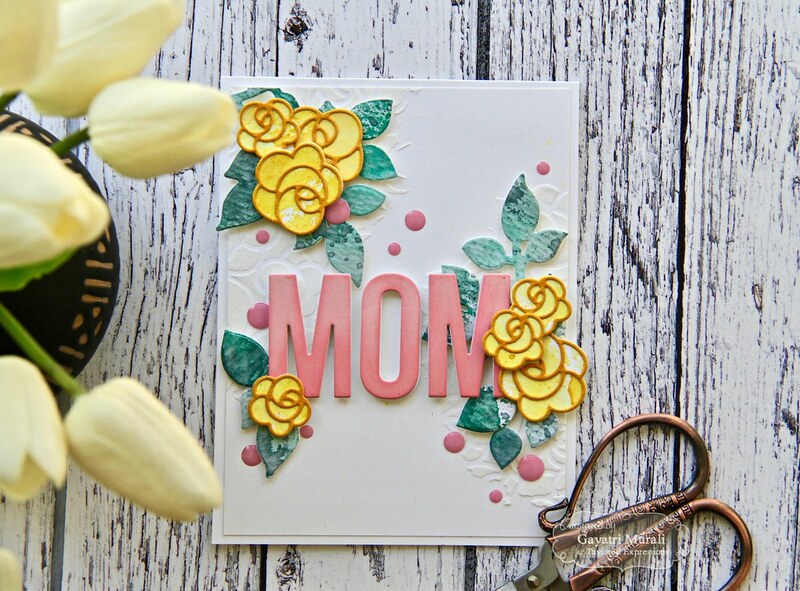 This is another mom card. I have used the stencil subtly on the background to texture. 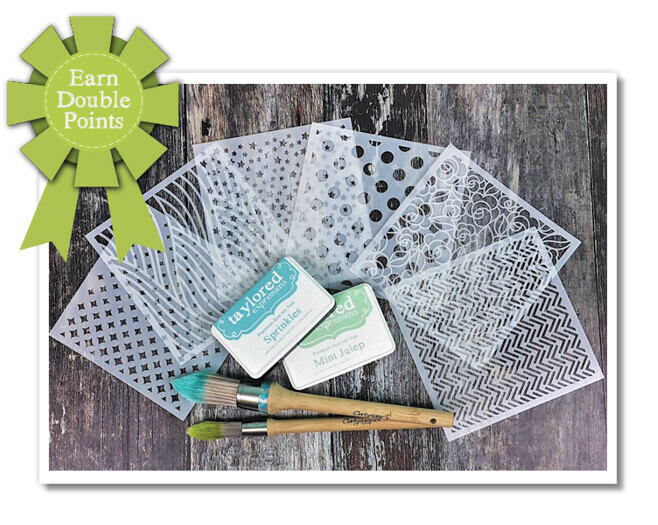 I sponged white embossing paste on the Beautiful Bloom stencil on the right side and left side of a Sugar cube panel. I sponged it randomly just to add texture to the panel. I smooshed Weathered Wood and Iced Spruce distress ink on TE watercolour paper and die cut a few using TE Leafy Branch die. 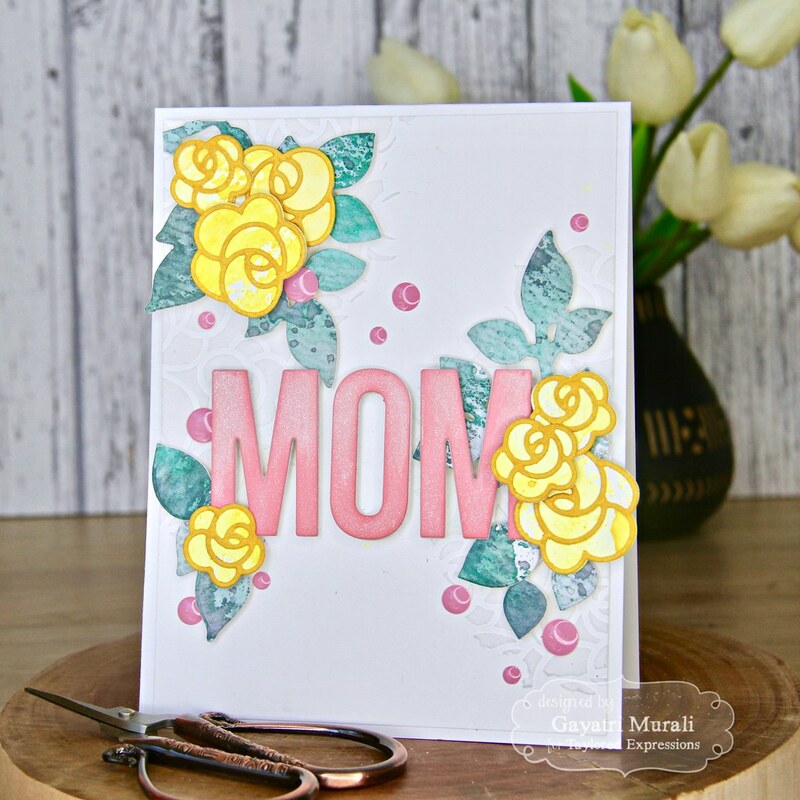 Similarly I smooshed Mustard Seed and Fossilised Amber distress inks on TE watercolour paper and die cut a few florals using the new Bloomer 8 dies. I assembled the outline on the base of the floral using glue. Then I made two large and a small clusters of flowers and leaves. I also die cut Caps Lock Mom die using sugar cube cardstock and sponged Guava ink in ombre fashion. 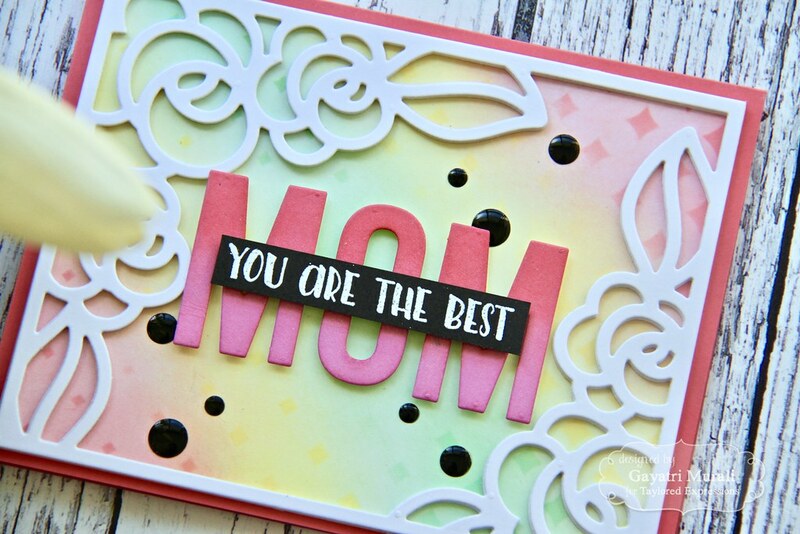 To assemble the card, I adhered the MOM die cut in the centre of the panel using foam adhesives. Followed by the the cluster of flowers and leaves as shown in the picture. Finally added Strawberry Milkshake enamel shapes to tie in with the guava coloured large sentiment. The whole panel is adhered to the Sugar Cube card base. Again all supplies used to make this card are listed below. Check out TE blog for more design team sneak peeks and leave them some love. See you tomorrow with Day #3 sneak peak projects. Have a lovely day!